I seem to be having an issue with the latest version of your mod. 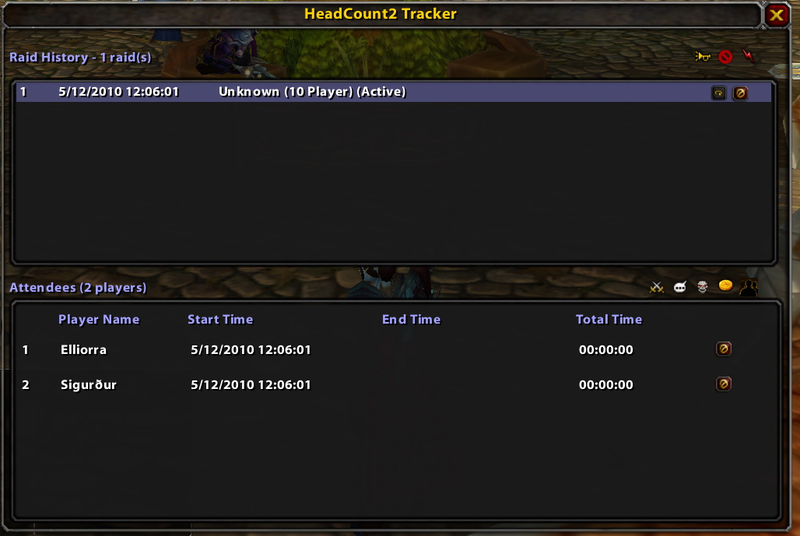 I currently track attendance for my guild using EQDKP-Plus version 0.6.4.5. When using version 1.0.6 of the mod, after changing the site import plugin from EQDKP-Plus to plain old EQDKP I was able to import raids into the site fine, but after changing to 1.0.7 I now get an XML-Error. Please check the log! from the site. When I downgrade back to 1.0.6 it is fine, so it seems like one of the versions you uploaded between 1.06 and 1.07 must have broken the import feature from your mod into EQDKP Plus sites. Not sure what I can send to you to assist in trying to figure out what is causing the bug as the logs on the DKP site don't really have much information, but let me know via comments and I can try to copy/paste whatever I can into another post. Is there any chance that you could implement native EQDKP Plus import support into the mod in future versions? i see thanks (re: active raids). how about a way to export the attendance summary? One tiny point i've seen - the difficulty-tag have to stand after the name-tag in the BossKills-group. It would be nice if you could change this in any further version. Nope, not really. I already tried this before, but this adds only the difficulty to the raid zone, not to the bosses. I think this is a relict from the past (<ICC) where you can't switch normal/hard-mode in the same instance. Ok, concerning my last post... I've installed some other raidtrackers, created testraids, export all the strings and compared it. There are some differences in realm- & guildinfos for example but it makes no sense if I add them manually or not. But after I've added the <difficulty>1</difficulty> tag after the Bosskill-Name the import works and RaidLogImport detected it correctly. Would it be possible to add this tag in the eqdkp-export string? well all i could say is see if others are having the same issue, my guikd doesnt use eqdkp and the code thats build the export format string is from original headcount so it may be wrong. Have anyone already tried to import the string (format: eqdkp) into an EQDKP-System? I just did it, but without success. ;( I've a german client & the boss/zone names in Raid-Log-Import are the same as in the string. As far as I could see the detection of the zone works but not for bosses. For one, I can't seem to get the "assign as disenchant" or "assign as offspec" buttons to work. I click the button and the dropdown changes to Disenchant or Offspec respectively, but it doesn't get saved as such by the addon, nor when I export it. For two, there are still lots of bosses that it doesn't have detection for—Valiona and Theralion are giving problems, as I can't figure out how you formatted their names on the hidden whitelist so I can manually add kills for them. no i cant, when you logout the client sends a 'left raid' message, and before you get control back on login its told you joined a raid. HeadCount is creating the raid cause it saw the last raid you were you in you left, closing the raid out and finalizing it. I dont have this issue cause when i need to switch its fast for me generally to just alt + f4 restart wow and relogin that waiting for the countr to finish. be possible to add a button to "make raid active"? running 1.04 and logging out deactivates current raid and can only start a new one. it doesnt actually need the localization, the warning he got was to let him know its missing from babble boss, and most likely we dont have a transaltion of the instance lock name. HeadCount2, tracks boss by instance locks. I dont watch combatevents or deaths at all. IT watches enter/leave combat and queries the instance locks to determine you beating an encounter. the only time i need to indicate anything for an encounter is if the boss isnt marked as a boss but as an elite or its a multi boss encounter to indicate which encounter they belong to. Also be aware some older instances bosses didnt die, they went friendly. worse case missing localizations may mark the boss incorrectly is all. I am tracking Unit_Dead and combat regen disabled, and it's more easy no? "- added another hook for logout to keep duplicates raid from being created - Hopefully this fixes the keep making new raids on reload issue"
was running 1.03 and just noticed last night relogging i couldn't reactivate or merge raids, that's what this refers to yes? nice and simple tracker mod, thanks a bunch. [00:53:49] HeadCount2 (1.0): Boss Ал'Акир not found in the instance lock list. Keep up the good work man on this great addon.